Drones have found a home in numerous industries as diverse as agriculture, energy, public safety, media, infrastructure and of course construction. Unmanned Aerial Vehicles (UAVs) or drones are one of the most promising and multifaceted technologies to come along in recent years. Innovation and the implementation of new technologies have always been hallmarks of the construction industry. With a seemingly endless list of uses both in the field and in construction planning and managing drones are game changers. Drones have found a home in numerous industries as diverse as agriculture, energy, public safety, media, infrastructure and of course construction. With UAV technology touching so many industries there are many hardware and software manufactures providing end users with a wide array of solutions applicable for use in construction. DJI is one of the largest manufacturers of drones in the world. DJI has entire sections of their company devoted to providing platforms useful in construction. Drones such as the Phantom 4 Pro are designed to not only take aerial photography, but also provide 2D/3D mapping, survey data and thermal imaging with the use of FLIR technology. Companies focused on the software side of this aerial technology provide even more tools to the construction professional. DroneDeploy is one of the most well established in the field. Its software platform provides project managers, superintendents and upper management in construction with aerial site intelligence for surveying that is both cost effective and more efficient than traditional methods. With relatively small investments of money and time, drones can become an addition to any company's tool set. Leaders willing to embrace this elegant combination of hardware and software are likely to be well rewarded for their efforts. Steven Wells is one such leader. As a general manager/vice president with Key Construction, Wells was instrumental in the introduction of drone technology to the company. With a dad and two uncles in the industry, Wells had construction in his blood and always knew he would continue in the family trade. After obtaining a degree in construction management from Kansas State University, he went to work for Key Construction as a project manager. Wells' interests in drones started not too long ago. “About three years ago I listened to a podcast that sparked an interest in construction technology,” said Wells. Of the various types of technology discussed drones seemed to Wells as the easiest to implement into operations at Key Construction. Starting with a DJI Inspire 1, Wells obtained his Part 107 sUAS license, the necessary certification for all commercial drone pilots. As Wells put it, “once I had the Part 107 the gloves were off.” Taking his drone to project sites, he was quickly able to show upper management how useful the technology could be. With upper management's blessing, he started taking his drone to other sites. In many cases, he was able to prove the benefits of the technology even when his audience was somewhat skeptical. “Once site superintendents could see a good use case or two for the drone, it's like wildfire, everyone wants to use it,” said Wells. Other project managers and site superintendents wanted to see how drones could help their projects to save time and money. 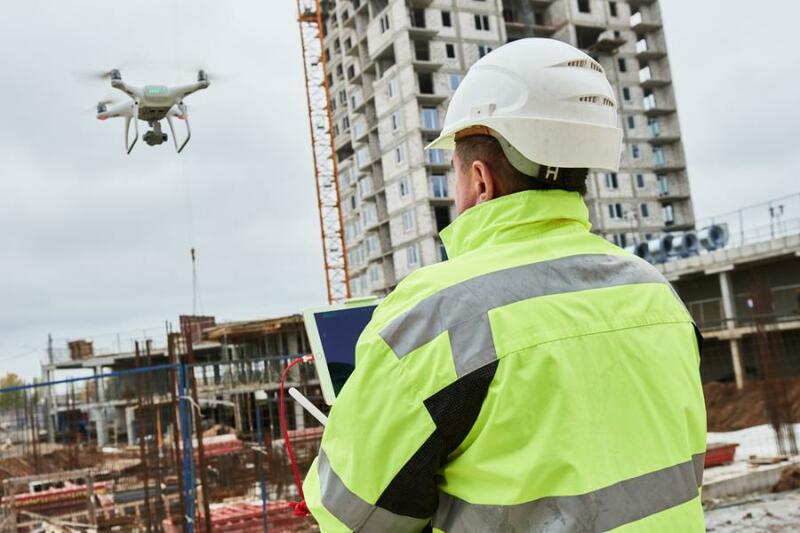 Key Construction, licensed to build in over 35 states, started a super users program to spread the use of drones and other technologies throughout their organization. The company now has two Part 107 pilots and plans to have a total of four or five within the next three months or so. Drones have helped give an edge to Key Construction and are likely to do the same for your company. With a multitude of real world uses the possibilities for drones in the construction industry are virtually endless. Embrace the platform and rise above the competition by starting a drone program with your team. David Daly is an Award Winning photographer and Certified (FAA) Commercial sUAS pilot (# 3991657). A graduate of the United States Naval Academy, David is a former Marine Corps officer with a BS in Oceanography and has earned his MBA from the University of Redlands. He is also a licensed Real Estate Salesperson (CA # 01898472) with a certificate in project management from the University of California, Irvine. David has worked for Fortune 100 companies with a background in aerospace, construction, military/defense, real estate, and technology. This unique combination of skills and experience allows our customers to receive unmatched service with unparalleled product quality.